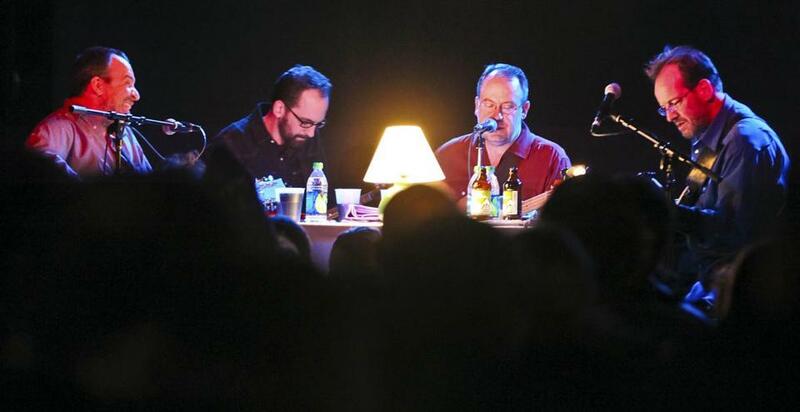 The Scud Mountain Boys performed sitting around a table on Saturday at Brighton Music Hall. “This is a new song called ‘Let Go of Those Dreams,’ ’’ John Cunningham said quietly at the Brighton Music Hall Saturday night. Needless to say, it was an inauspicious line for the reunion of the Scud Mountain Boys, a Massachusetts band that huddled at the slow, sad end of the alt-country spectrum in their mid-1990s heyday. Earlier in the evening, onetime Scud Mountain Boy Frank Padellaro ended his willowy set by saying, “If you haven’t hung yourself yet, here’s one more.’’ Cunningham, in turn, flew over from Liverpool to promote two mild-mannered albums rereleased on Ashmont Records, a Dorchester label started by the Scud Mountain Boys’ leader, Joe Pernice. The sparse, older crowd received the solo artist politely, at best. Fortunately, by the time the four 40-somethings in the Scud Mountain Boys gathered around a kitchen table - replete with tablecloth, lamp, and beer bottles - the crowd had doubled or tripled in size, and Pernice displayed the same wry humor that had lightened Scud Mountain shows back in the day. “This is our second show in 15 years,’’ said Pernice, fresh from his performance at New York’s Bowery Ballroom on Friday. “Our sound man last night told us, ‘Wow. That sounds like only 12 years since you played.’ ’’ But as soon as the band lay into the opening “Peter Gray’s Anatomy,’’ the four old Massachusetts friends improved on their original material in every way. Over the past 15 years, Pernice has honed his talent with brother Bob in the Pernice Brothers, a group whose gorgeous guitar-pop suggested that the Scud Mountain Boys were just a trial run. But his former bandmates matched Joe Pernice’s growth with their own remarkably warm, elastic performances throughout the 90-minute set. At one point, around the stroke of midnight, mandolin player Tom Shea quietly moved over to a drum kit and lay into the beat that climaxes “Massachusetts.’’ The beat can be heard on the 1996 album of the same name, too, but on Saturday, the drums smacked like an unexpected New Year’s kiss, renewing dreams for another day. Franklin Soults can be reached at fsoults@gmail.com.